February is Brotherhood month, often celebrated in schools, and in state and national ceremonies. Any such celebrations in your neighborhood? 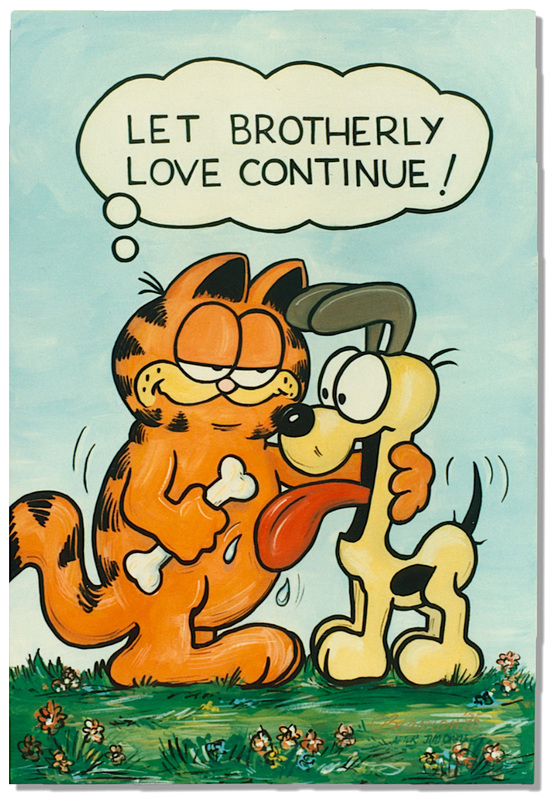 What does the body language of Garfield and Odie suggest? If you created a sequel to this painting, how would it look? We can use more love–brotherly, sisterly, and every kind. The month of February has gone through an evolution with various tags. In my elementary school, we celebrated Valentine’s Day and the presidents, Washington and Lincoln. Since the 1950s, brotherhood became the month’s emphasis: http://credo.library.umass.edu/view/full/mums312-b136-i376. When I taught at the college, we highlighted the month as Black History Month. That’s a good question, Syed. I don’t know the answer to that except that speakers and writers in many societies are just following an old tradition. Thank you for suggesting that embracing all people includes women too. That’s a nice compliment. Thank you, Syed. Oh dear, I don’t think that Garfield’s intentions are benevolent… Or brotherly. Yes, Garfield is such a sarcastic beast. He must have lapsed in this picture. Or maybe we was won over by Odie’s compassion, if only temporarily – ha. Thank you! Cliff painted this? What a great knock off of the famed pair. I had to chuckle at your topic because my oldest daughter just sent me a video last night of her two boys, ages 4 and 2, fighting and the older one crying because Grandma had sent a late birthday present (long story, but the little Thomas the Tank Engine train finally arrived from Japan, who knew?) and while the older boy had been just fine when the younger opened his other birthday gifts at his party (we were there) and older boy knew he couldn’t take them away or play with them immediately (he acted so mature! ), this late gift perhaps seemed unfair that Grandma hadn’t also sent him something (I did send him a letter with an activity for him, as promised, but it arrived long before the train gift). At any rate, the four-year-old had to cry and whine while mama gently reminded him of the rules on birthday gifts. Later the brothers laugh and play though, so yes, he got over it. That’s brotherly love, for me, today. I love your story, Melodie. It seems some of the complication has happened because of the quirks of mailing. Nevertheless, those boys are learning life lessons here. Thanks for sharing this – serendipitous! Now I’m looking forward to February. I didn’t know that it is all about brotherhood, great! Thank you! Welcome and thank you, Cecilia. I’m glad this post has given you something to look forward next month. I had never heard of Brotherly month. It seems like hardly a day goes by now without it being some kind of special day. I like that picture, though. Garfield looks a bit mischievous, but also showing some tenderness and kindness towards Odie, who simply looks like he can’t believe his luck and is about to jump for joy. I would expect the sequel would have both characters sharing the bone. Coming from a large family of 10 siblings, we always shared everything, including underwear!!! I like what you have read into the Garfield/Odie portrayal and the imagined sequel. Of course there are many benefits of coming from a large family. You learn early on that the world does not revolve around you. Apparently several of your sisters where the same size if you shared underwear. What a hoot! We are very closed together in age. I picture the same kind of Garfield character sharing a bone with the neighborhood big dog that he runs across sometimes. Or perhaps sharing a tidbit with the kitten he sometimes puts up with. Or giving a big opened armed [pawed?] hug to the reader. Possibilities are endless, as are our opportunities to show brotherly love. Thanks for your insight, very wise, Ginger. I especially like the hug to the reader. That’s huge! Wow! Cliff is so talented…must take after his wife. 🙂 Garfield looks like he’s teasing the dog, or maybe trying to bribe him. I wasn’t aware of Brotherhood month, Marian. Thanks for putting me into the know. Thanks for the compliment, which I’ll pass on to hubby. Garfield is a cage-y animal, no telling what he’s up to. One of the magical things about blogging is sharing info and insights. I always learn something from your blog. I’m glad the relationship is reciprocal. I appreciate your showing up here weekly, knowing that you are upholding a day job as well as a writerly profession. Cheers, Jill! I always love to visit your blog, Marian. Sorry I was late today. It’s been one of those weeks. I’ll fill you in on Friday. Have a great night! I think Garfield has a trick up his sleeve and Odie won’t get the bone for nothing. It looks like a bribe. Not sure why, but Garfield reminds me a bit of your president whose State of the Union Address my husband and I watched in its entirety last night. My husband watched the entire speech while I was asleep Our populist President has ignited a lot of interest world-wide, including you and other Canadian readers. He definitely does not fit the mold of those who previousy held this office. Thank you for commenting here, Elfrieda. You bet, Liesbet! Roaming about requires all of that, and so does staying put. Now over to check out your newest blog. A great picture. Odie looks pretty happy at the prospect of a bone to chew on, just like Dot would be. Not sure if Garfield would expect something for giving it to him or not. I was not aware of February being Brotherhood month but it sounds like a good idea! Because Cliff did presentations in schools under the “Brotherhood” theme in the 1980s-2000s I assumed many people knew about this designation. This just goes to show that assumption can’t be trusted – ha! About Garfield – he would probably expect something in return, knowing his often ulterior motives. Here’s to brotherhood and sisterhood! Oh me, oh my, Cliff is a fantastic artist! As often happens, our thoughts are on the same train, Marian, which is why I like reading your posts — not because we think alike, but because you write about goodness, beauty, and love, which is more of what we all need. I wasn’t aware that February is brotherhood month. Thank you for giving me something good to think about! The longer I live, the more impressed I am with sharing the good. This may be a function of my age or the crazy times we live in. Either way, I’m glad we’re riding the same train, Tracy! Your husband is a clever man , what fun to be married to an artist 👩‍🎨. I’ve never heard of Brotherhood Month but equally I didn’t know a fat lot about Candlemas either ( a friend from writing group sent me a poem she’d written centred around Candlemas ) so I’ve learned new things this week which is always good . Everything here in Pentregat hunkers down , snuggles under the duvet and awaits spring . Sleepy without doubt ..no celebrations here but hey ho that’s ok , we celebrated Christmas now is time to reflect . I love your emoticon of artist with driver’s hat. My husband actually wears one of these, maybe a nod to the British – ha! I will pass on your compliment, dear Cherry! Yes, please. What a beautiful image for a children’s hospital. Cliff strikes a sweet chord in my heart. May love be kindled between brothers and sisters and people of different races and ethnicities and religions–and dogs and cats and bees and butterflies and all wild creatures. May we remember that compassion is the most important thing we have to give. We can do better as a country. We must do better. Love changes everything. There is so much rancor and divisiveness in our dear country now. I simply cannot and will not address it on social media. Images like these preach my sermon. And yours too. Yes, we MUST do better as a country. LOVE changes everything. Indeed, Elaine! Knowing Garfield as I do, I have a feeling he has an ulterior motive with that bone. Poor Odie. He just never learns! As a kid, February was spent celebrating Valentine’s Day and President’s Day. I think it wasn’t until I was in college that I learned it was also Black History Month, but I’m not sure when that was established. I have never heard of Brotherhood Month. Thank you for teaching me something new! Thank you for stopping by with a comment too, Kate. Your hunch about Garfield is probably correct – ha! I remember reading your post about failure being a good thing. I also noticed that you are gearing up for a new website. More power to you – and best wishes for a smooth-as-silk transition. Thank you for introducing me to the word Ubuntu, which sounds more encompassing than Brotherhood. I am so glad we can send positive energy back and forth from South Africa to our continent. It’s bound to do good, even if the results are not always evident right away.